Gerhard Becker and his previous attorney at a pretrial hearing in 2012. © Artist Thomas Broersma 2012, all rights reserved. I'm on the 9th floor of the downtown criminal justice center. The hallway is virtually empty. There are less than a handful of jurors from Dept. 109 who have just arrived. Gerhard Becker is charged with involuntary manslaughter in the death of firefighter Glenn Allen. Allen died while fighting a fire that broke out in Becker's 12,000 square ft., Hollywood Hills home in February 2011. Becker was arrested about a year later. DDA Sean Carney arrives on the 9th floor and breezes by me to enter Dept. 104, Judge Robert Perry's courtroom. I quickly get up to follow him in. Becker and a girlfriend I've seen on previous hearings are already inside the courtroom, seated in the last row. I take a seat in the second row. 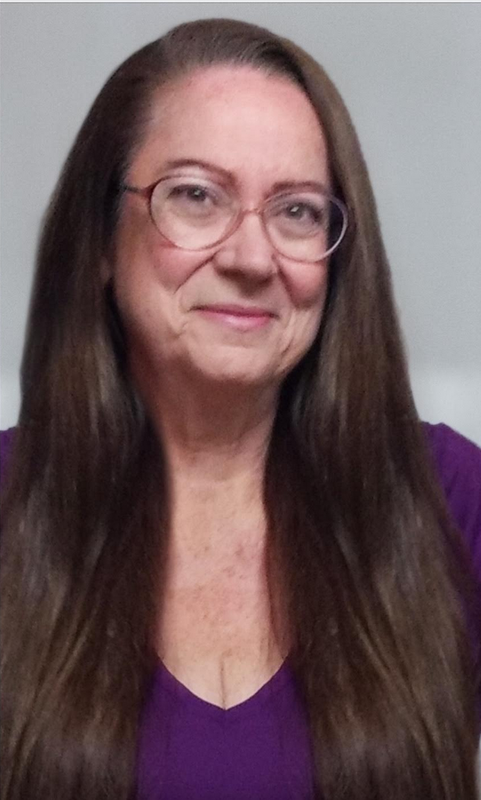 I mention to DDA Carney that DDA Deborah Brazil will be sworn in today to the Superior Court. Carney indicates that the other DDA that will be sworn in, Frank Tavelman, is in his unit and a good friend. 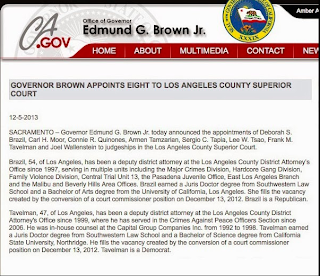 On December 5th, Governor Brown announced eight appointments to the bench. I knew that Ms. Brazil was being interviewed by the governor's office back in September, but it was unofficial. I did not have permission to write about what I knew. The political blog Los Angeles Dragnet reported the appointments on Friday. I learned about Ms. Brazil's appointment on Monday when a friend sent me the notice. DDA Brazil and DDA Tavelman will be sworn in today in Dept. 100 at 12:15 PM. I first saw DDA Brazil in action during the Conrad Murray preliminary hearing in January 2011 and during the recent Barnes & Bolden prelim. She's a very talented prosecutor and I'm looking forward to attending her swearing in ceremony today. There are at least eight DDA's that will be running for two vacant Superior Court seats. It's unknown at this time who will be paired up against each other and it could turn into a Hunger Games like blood-bath. DDA Carney tells me he's currently in trial in another courtroom. What he tells me about the case piques my interest. After this hearing is over, I don't have anything to do until the swearing in so I tell him I'll probably follow him up to the 15th floor and sit in on his case for a few hours. Carney tells me the case is in Dept. 127 on the 15th floor and that the defendant is pro per. We're waiting on defense attorney Donald Re. Judge Perry's clerk Melody is not at her desk at the moment. DDA Carney and Judge Perry's court reporter Beth chat about getting ready for Christmas and how fun the holidays are with little ones. Beth has on a cute black and gray outfit today. It's a long, form fitting tailored top with a pronounced flair at the hips. It's paired with a long complimentary skirt. A woman comes in and speaks to the bailiff. The bailiff points out Becker, who is still in the back row. 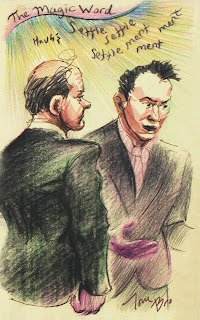 I overhear him tell the woman that they "...don't do that sort of thing inside the courtroom, but you can take a seat." I'm guessing she is here to serve Becker with papers. Judge Perry takes the bench. I believe I hear him tell the room, "I think I set this thing for nine (9:00 AM)." Judge Perry and his court reporter chat. She jokingly chides him that he didn't tell her he was leaving early on a prior day. Judge Perry had a doctor's appointment. He jokingly responds, "What are you, my mother?" It's a pleasant, jovial conversation. Judge Perry then addresses his bailiff, asking about someone the bailiff knows. The bailiff used to play football and there is a conversation about where the bailiff is from. Judge Perry then shares a personal experience about when his children were very young and experienced snow for the first time. Donald Re enters and stops by the back row to speak to his client. I over hear him say, "...and there's a lady outside if you want to get served." Judge Perry is reading motions at the bench. Re is going to go grab DDA Carney, who left earlier for a hearing down in Dept. 107. As the attorneys follow Judge Perry into his chambers, their voices are loud. I'm guessing Judge Perry left the door to his chambers open. The bailiff advises the clerk to close the door to the back area. Even so, I can still barely hear DDA Carney's voice. Behind the clerk's desk, I can see the days that are blacked out on December's calendar. Judge Perry's courtroom is dark from December 13 through the 31. It's totally quiet in the courtroom. I note that there appears to be a new piece of equipment in the well by the court reporter's desk. It looks like a printer combined with a cabinet. I hear the faint sound of a radio, but I have no idea where it's coming from. Becker leaves the courtroom to take a phone call. A few moments later, Re and DDA Carney emerge from Judge Perry's chambers. I believe Re goes out to speak to his client. Judge Perry, DDA Carney and the court reporter talk about Carney's other fire case involving a German national, Harry Berkhart. That defendant is facing 100 counts. The discussion is about reading all those counts into the record. Judge Perry shares that he had a case with 129 counts and he told counsel there would be a summary reading of the verdicts. Beth shares that Judge Kennedy had a case with more counts than that. They were all read. Judge Kennedy read some, the clerk read some, and another clerk was brought in to read some of the verdicts. Smiling, Judge Perry says, "I did 125 [counts] in half an hour." Judge Perry discusses a prior case in his courtroom. DDA Carney is asked about his current assignments. He explains that he is also involved in cases involving explosives and several other interesting cases. Mr. Re returns and Judge Perry goes on the record. "We have discussed the case ... and have everyone come back on January 3, 2014, at 8:30 AM for further proceedings. And that's it. Out in the elevator bay, Becker's girlfriend gives a hug to Re. I go down to the cafeteria to wait until 10:30 AM when DDA Carney's other case will pick up again in Dept. 127. I sit in on that case until noon and then head to Dept. 100 to attend DDA Brazil's swearing in ceremony. I'll have that report up in another day or two. The DA's weekly calendar indicated that Becker's next hearing on January 3 is a plea hearing. Another source confirmed that Becker will be taking a plea. I'm looking forward to reading what the plea is. I hope it's not too lenient. This guy certainly played fast with the construction rules.